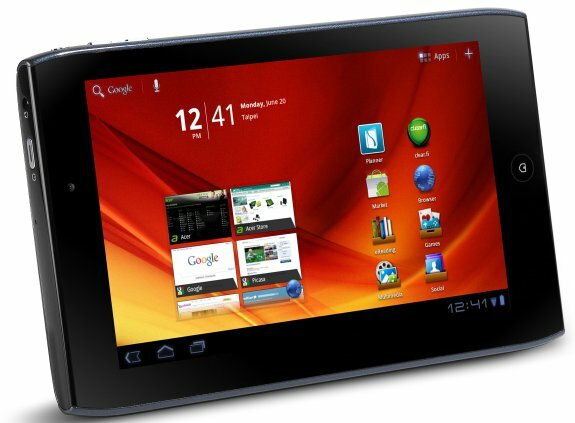 Acer shows off the A100, a new 7" tablet with Google's Android 3.2 "Honeycomb" operating system. The device offers a 0.92-pound design that is sleek enough for single-handed use and offers a 1024 x 600 pixel resolution. Prices start at $329.99. Acer America expands its Acer Iconia(tm) Tab line of tablets with its first 7-inch tablet - and the industry's first 7-inch tablet running Android(tm) 3.2 (Honeycomb) - in the United States and Canada. The new Acer Iconia(tm) Tab A100 features an incredibly portable sub-one pound design, a vibrant 7-inch multi-touch display, and a sleek, thin design that is comfortable to use and take virtually anywhere. With the Acer Iconia(tm) Tab A100 tablet, customers can have a single portable device for enjoying entertainment such as games and websites as well as productivity applications such as a calendar and email. The tablet comes pre-installed with Adobe Flash Player 10.3, so Adobe Flash games and websites can be enjoyed right out of the box. In addition, the WiFi device is the ideal size for moms, families and individuals who want to stay entertained and productive, since the screen is large enough to enjoy video and other multimedia, yet the device is portable enough for comfortable single-handed use. Weighing in at a mere 0.92 pounds and measuring only a half-inch thick, the Acer Iconia(tm) Tab A100's super-portable size makes it easy to take anywhere. The vibrant 7-inch TFT WSVGA screen displays social networking sites, photos and more in 1024x600 resolution and high-color contrast, so customers can enjoy crisp, vibrant content enhanced by a 16:10 aspect ratio and 75-degree wide viewing angle. Plus, the 7-inch capacitive touch-screen is incredibly responsive and accurate for convenient finger-tip control. "The Acer Iconia(tm) Tab A100 tablet delivers the ultimate combination of portability and performance for fun and gaming as well as staying in touch," said Sumit Agnihotry, vice president of product marketing, Acer America. "Families are spending more time social networking and enjoying web-based digital media, so a highly portable tablet like the Acer A100 will let them get more done and stay connected on-the-go to enjoy their lives more fully." The Acer Iconia(tm) Tab A100 is the ultimate companion for mobile consumers such as moms and families who want a single device for gaming, fun, entertainment and staying in touch on the go. Customers can enjoy movies right out of the box with the Google(r) Movies app that allows users to rent and play movies on the Acer A100. Also, Google(r) Music gives customers instant access to their personal music collection on the web without the hassle of wires or syncing. Customers can also use NemoPlayer(r) for video, photos and music and Aupeo! for enjoying online radio. Dolby(r) Mobile Technology on the tablet delivers dynamic sound to enhance the enjoyment of music and movies. In addition, the Acer Iconia(tm) Tab A100 can be connected to a TV via its HDMI port, so customers can share full HD videos in 1080p resolution. Game play can also be extended to a big screen TV or display with the Acer A100's HDMI port and dual-display support. As a result, more people can watch and enjoy the game as it is mirrored to the larger screen. Plus, the Acer A100 can be used as a controller for the game as the player watches the image on the larger display. In addition, games are crisp, fast and realistic thanks to the performance technology and six-axis motion sensing gyro meter. Customers can enjoy rich and exciting Adobe-flash based Web pages, games, videos and animations with Adobe Flash Player 10.3. Thousands of additional apps can be easily downloaded from the Android Marketplace. The Acer Iconia(tm) Tab A100 allows customers to always be ready to take photos and video on-the-go and quickly share them by email and on social media sites. Lighter than most SLR cameras, the Acer A100 has a 5MP rear-facing camera with flash, so families will know they have a great camera with them to capture all of life's fun and unexpected moments. It also records clear and detailed HD Video at 720p at 30 frames per second. Plus, the rear-facing camera can be used with many available apps to read bar-codes and QR codes for shopping and other promotions. The tablet also has a 2MP fixed-focused front-facing camera and webcam for video chats. Reading and Productivity Apps Let Moms and Families Get More Done The Acer Iconia(tm) Tab A100 e-reading functionality will be appreciated by a range of family members. Moms and dads can download e-books to enjoy during quiet moments in comfortable single-handed usage. The tablet comes pre-installed with Acer LumiRead and Google(r) Books eReading apps for enjoying e-books. Plus, the color screen vibrantly displays children's e-books, so they'll always have something to enjoy during long or unexpected waits. Extra features like the realistic page turn effect make reading even more fun. The auto-rotation allows customers to enjoy e-books, games, movies and more in either landscape or portrait mode. In addition, everyone can stay up-to-date with extended family and friends via Acer's Social Jogger, which puts Facebook(r) and Twitter(r) in one place for quick and easy reading and updates. Moms can keep their family schedule organized with the easy-to-use Acer "Day Planner" application that gives an easy-to-view list of upcoming activities. Working moms and those with busy schedules will appreciate that the Acer Iconia(tm) Tab A100 helps them stay productive. Customers can set up multiple email addresses and view Microsoft(r) Office documents using the trial version of the "Docs to Go" app for getting things done quickly. Android 3.2 Brings Additional Benefits for Browsing and Entertainment The Acer A100 comes installed with Android 3.2, the latest version of Honeycomb to give customers the latest in advanced mobile browsing. Customers can browse the Internet with speed and ease, even web pages built with Flash, thanks to Adobe Flash 10.3 that comes pre-loaded on the Acer A100 tablet. In addition, Android 3.2 lets customers have more control over their entire browsing experience, such as managing web pages by tabs, more advanced privacy settings, and proper sizing of apps and web pages for the 7-inch display. The Acer Iconia(tm) Tab A100 can quickly and easily connect to Wi-Fi networks via the integrated Acer InviLink Nplify 802.11a/b/g/n Wi-Fi CERTIFIED wireless technology to access the Internet, the Android marketplace for apps and more. Customers can enjoy their own digital content on the Acer A100 tablet by transferring files such as videos, movies and eBooks to it through the tablet's micro-USB port or by using the Micro-SD card reader that can read Micro-SD cards with a capacity up to 32GB. Plus, the integrated Bluetooth allows consumers to connect the tablet to a variety of other devices, such as headsets and keyboards. The Acer Iconia(tm) Tab A100 packs maximum performance into its incredibly portable size. It uses a high-performance NVIDIA Tegra 2 dual-core processor with 1GB of RAM to give customers blazing fast access to multiple programs and apps at once. The Ultra Low Power GeForce(r) GPU enhances gaming, web, and multimedia for a more realistic, responsive experience. Acer Iconia(tm) Tab A100 comes with Acer clear.fi, which connects with any other DLNA-compliant device to quickly and easily share and enjoy digital media. It automatically detects clear-fi-enabled devices on the wireless home network (smartphones, notebooks, HD media players, etc.) and gathers and organizes media files by type (video, music, photo, pre-recorded TV). The Acer Iconia(tm) Tab A100 is available in the U.S. now at national retail stores and will be available in Canada next month. The Acer Iconia(tm) Tab A100-07u16u with 16GB of memory(2) has a manufacturer's suggested retail price of $349.99 U.S and $399.99 CAD, while the Acer Iconia(tm) Tab A100-07u08u with 8GB of memory(2) has a manufacturer's suggested retail price of $329.99 U.S. and $349.99 CAD.